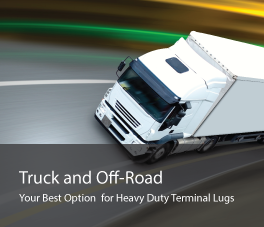 ASK’s terminal lugs, splices, connectors and grounding straps are found on virtually every truck that takes to the open road, and even on the rugged vehicles that go beyond. Our auto, truck and heavy vehicle parts have been incorporated into the designs of every major truck and off-road vehicle manufacturer in America, thanks to a pedigree that stretches to World War II, when we were the sole supplier of waterseal terminals to the Tank Automotive Command. We remain the only American supplier that provides in-house military-spec custom tooling and prototyping to truck and offroad OEMs and after-market suppliers. We’ve been UL 486 A listed for more than 25 years, and we continue to offer terminal lugs, splices, connectors and grounding straps for all truck, heavy-duty and offroad applications – including matches for every item Tyco produced through their exit from the industry in 2005. Not sure what you need? Visit our product configurator today, or download our 2,500-part catalog.